Photo: Merimbula Beach - located on the Sapphire Coast part of the NSW far South Coast. Golden sandy beaches, extensive lakes and rivers, green hinterlands and woodlands. No single photo, or even collection of photos can show all the splendour of the New South Wales South Coast. But here are some anyway. The South Coast of NSW is made up of three regions - Shoalhaven, Eurobodalla and the Sapphire Coast. Each has their own charms and attractions, historical towns, sleepy fishing villages and places to visit. Go there and experience it all in real life. You know, with ocean fresh air, interesting wineries, wild beaches and grand National Parks. Experience some excellent restaurants along the way, serving tasty cuisine made from the fresh local produce and daily sea catch. Another great experience is the Whale watching and dolphin watching cruises, but this part of the South Coast also has excellent diving, fishing, boating and a whole range of other watersports. Exploring the vast wilderness areas along the coastline and in the National Parks here will leave you with life long memories. Stunning vistas of vast untamed wilderness, pristine coastline and beaches, tall eucalypt forests, lush hinterlands and an enjoyable lifestyle await visitors to the South Coast of NSW. A popular way to drive from Sydney to Melbourne is the Princes Highway with a stopoff in the Gippsland in North East Victoria or the South Coast of New South Wales. Either or both are wonderful. Touring this part of the Australia East Coast and its surrounds, from the inland Snowy Mountains, Capital Country and the Victoria High Country, or via the coastal areas of the Gippsland of North Victoria and then to the Sapphire Coast is great any time of year. See Touring the Victoria Coast. Not far from the South Coast are the Snowy Mountains. About 4 hours drive west via Cooma on the Snowy Mountains Highway, snowfields with just about every snow sport except reindeer skiing is available. During the warmer months, both the Snowy Mountains and the Victoria High Country are Alpine wonderlands, with white water rafting, great fishing, mountain hiking and scenery. All along the South Coast and in the hinterlands, you can find places to stay in: luxury resorts to scenic campsites in National Parks. Accommodation available includes a wide range of styles to suit almost any budget. You can find Sth Coast ocean side resorts, conveniently located hotels, bed & breakfasts near the beach or in the country, caravan parks, serviced apartments and holiday beach homes. 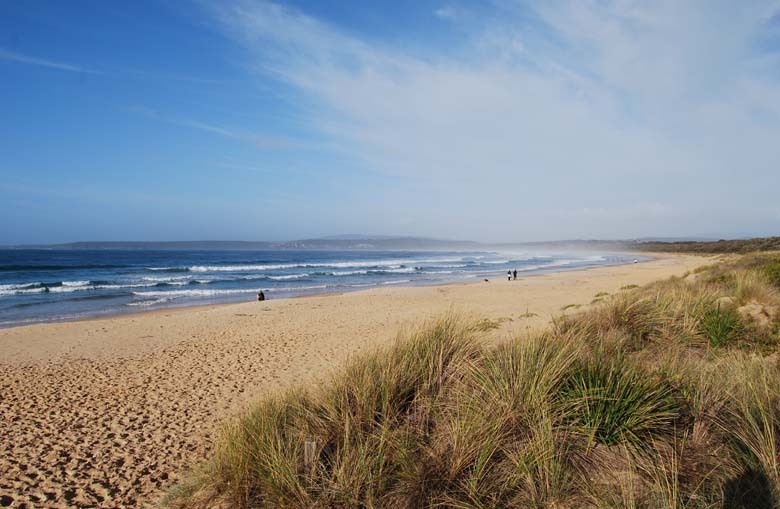 Main Photo: Merimbula Beach - located on the Sapphire Coast part of the NSW far South Coast.